Lalibela is a city in Ethiopia that is a centre of pilgrimage for much of the country. It has a population of 15,000. Ethiopian Airlines has scheduled flights at least once a day to Lalibela Airport (ICAO code HALL, IATA: LLI). Flights are often overbooked: make sure you reconfirm your seat at least 1 day in advance and show up at the airport on time! Flights can also be rescheduled or cancelled at short notice because of weather or for operational reasons. The airport is mid-sized. For a tiny town like Lalibela, the airport seems over-sized. It is at least 30 minutes by shared taxi (40 birrs per person as of 2008) away from the town. As of May 2013, most hotels will agree to pick you up for an extra 70birr. 70 birrs for a minibus to/from Lalibela was confirmed December 2013. 100 birr per person as of June 2017. The drive takes around an hour. There is a daily bus from Addis Ababa. It is a two-day journey with an overnight stop at Dessie. The bus passes through Woldia mid-morning and will pick up passengers from the bus station if it has room. Another bus runs daily from Woldia, leaving at dawn. Both the Woldia and Addis Ababa buses depart Lalibela at 6am. It is usually possible to get to/from Bahir Dar by bus in one day by changing buses at the village of Gashena, approximately 1-2 hours from Lalibela depending on traffic and weather. If you are travelling to or from Gondar by bus, you will usually have to spend the night somewhere. Coming from Aksum the best possible way would take about two nights with stopovers in Mekele and Woldia. However, if you are lucky you might be able to catch a shared taxi in Mekele which brings you along Highway 1 to Woldia where you the next day can catch a bus heading towards Bahir Dar with a stop at the Gashena Junction to Lalibela where you have to wait for another bus/car bringing you to Lalibela. This might take a few hours. The road to Lalibela is fine until you get to the village of Gashena, the last 1-2 hours consists of a small and unreliable road which is partly made of tarmac and partly sand. From Bahir Dar the drive takes about 7-8 hours and from Gondar about 10-11 hours. It is possible to get private drivers in both Bahir Dar and Gondar, would cost about 100-200 $ depending on negotiations, location and driver. You can rent minibuses to drive you around the city. They usually are found outside the airport. Unlike other bigger towns and cities in Ethiopia, there are NO blue and white minibuses that regularly run through this small town. There are a few horses pulling carts. You can walk safely around town (although people may look at you strangely or with amusement). School children may try to befriend you, and follow you around, perhaps beg. As of 2010 and onwards the government has tried to forbid begging, the situation is at this point much better than before but some people can still beg or invite you to their homes where strategic begging can be done. Walking is the best way to get around, as you can even get from the far Southern point (where the Tukul Village hotel is located) up to the far Northern point (Ben Abeba restaurant) in 25mins. Aside from children coming up to beg (see section below 'Stay Safe'), the roads are completely safe to walk on. At night, you just might want to bring a flashlight since roads are not well lit for passing cars to see you. All 11 churches are easily seen in one half day by foot (be sure to get a guide). This rural town is known around the world for its monolithic churches, which were built during the reign of Lalibela, king of Ethiopia. As of September 2017, entry ticket is USD 50 or 1012 Birr to visit and you are required to show passport or give them your passport number. The entry is valid for 5 days and at each site, the guard may ask you to show passport number matching your entry ticket. The Northern Group: Bet Medhane Alem, home to the Lalibela Cross and believed to be the largest monolithic church in the world, probably a copy of St Mary of Zion in Aksum. It is linked to Bet Maryam (possibly the oldest of the churches), Bet Golgotha (known for its arts and said to contain the tomb of King Lalibela), the Selassie Chapel and the Tomb of Adam. The Western Group: Bet Giyorgis, a cross-shaped church entirely carved out of a giant rock, said to be the most finely executed and best preserved church. This is the most prominently featured church on the Lalibela postcards. The Eastern Group: Bet Amanuel (possibly the former royal chapel), Bet Merkorios (which may be a former prison), Bet Abba Libanos and Bet Gabriel-Rufael (possibly a former royal palace), linked to a holy bakery. The best way to access this group is to enter via Bet Gabriel-Rufael, then via a dark trench next to the church you will access Bet Merkorios, Amanuel and Abba Libanos. Note the the entry cost (USD50) is completely outrageous by the Ethiopian standards, and represents well over the monthly income of many ordinary locals. The money goes directly to the church and no further control is exercised over its spending. This is coupled with repeated disrespectful public discussions how 'ferenji' should be charged more and more and they will still come and pay. While the churches are certainly imposing, it's everyone's own choice whether to put up with this attitude, or to boycott visiting the churches until more respect to visitors is shown, and the cost of visit is brought in accord with some reasonable norms. There many much more responsible ways to spend your money in Ethiopia. Licenced guides are available from the tourist office or ticket office in Lalibela for 600 birr per day per person (but in reality the price is negotiable). These guides are well trained and have an excellent working knowledge of the churches and good relationships with the priests. Do not try to hack it yourself without a guide, the knowledge that they offer will make the experience that much more impressive for you. Unlicensed guides will approach you all over the village, but they often know very little about the churches and are best avoided. You can get an official guide from your hotel as well. The churches are open from 8:00 AM to noon, and then from 2:00 to 5:00 PM. Various sites advise arriving at 6:00 AM to experience the beginning of morning mass, which is a worthwhile experience. However, independent travelers (those not with a tour group) should be aware that the ticket office may not be open then and there may be some trouble arranging payment and entry with various official security officers and official and unofficial guides. Additionally, you will likely find yourself surrounded immediately and persistently with men advertising themselves as guides and making a disruptive fuss. Farther afield is the monastery of Ashetam Maryam. Starting near the middle of the town, this church is a 1.5hr hike up the mountain where you will pass many locals walking to the market. Near the top you will find a hilltop farming village, where many of the locals will offer to sell you coffee or souvenirs. The hike itself is beautiful and worth doing, but the church is not worth the entry fee (350birr). The ticketing booth has been moved further down the mountain, just past the end of the village (July 2018), and you will need to pay the entry fee to the church in order to continue your ascent for the last few minutes and view the exterior of the monastery. Yimrehane Kristos church (entry 200 Birr November 2014), which predates Lalibela churches, built in the Aksumite fashion but within a cave is worth a visit despite having very limited local transportation options. A car from Lalibela town should cost around USD 80 or 1600 Birr. Again the prices are negotiable. Contrary to certain spurious myths, the great rock-hewn churches of Lalibela were not built with the help of the Knights Templar; rather, they were produced solely by medieval Ethiopian civilization. However, there is controversy as to when the churches were constructed. 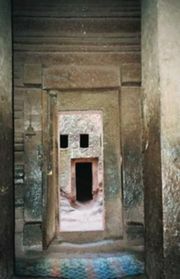 Some scholars believe that the churches were built well before Lalibela and that Lalibela simply named them after himself. Visit the weekly market for a glimpse of local weaving and an invaluable insight into local life. Make sure you visit the donkey park. There is an ATM at Dashen Bank that gives birr currency. It accepts among others Visa, mastercard, Maestro. Usually seems to give 4.000 birr max. The souvenir shops in Lalibela are overpriced. Wooden sculpture art will sell for ETB 300, which you can get for ETB100 at the airport, or even less from the souvenir street in Addis Ababa. The shops have fixed pricing. Surprisingly, the airport is not a bad place to buy souvenirs - save your money for either here or Addis Ababa. Asheten Hotel, near the bus station, rates from Birr 200 (although you should be able to negotiate it down), nice and quiet place with hot showers. Has a nice quiet garden terrace where you can relax. As most places in Lalibela, no Wi-Fi. In December 2013, the double room was 300 Birr. Seven Olives Hotel, right next to the bus station, Birr 500. Nice grounds, with hot showers and a good restaurant. On the leafy garden terrace you can enjoy a drink while watching birds whn it's quiet. Wi-fi internet is available and relatively fast. Roha hotel Double room is 77 USD, single is 64 USD. More than any other city in Ethiopia, you will encounter many children who will approach you and ask for money. The greeting of "Hello money" is a common one. A typical scam is to ask you to purchase a dictionary for their school, which the overpriced tourist shops just happen to carry for $50 each - this is a scam. It may pain you to ignore these kids (especially those who grew up in the West and remember the 1990's famine post-Derg). Many will tell stories about coming from the countryside and having to pay their own schooling, or not having shoes. While they are undoubtedly poor, these are lies to try to guilt you into giving them money that they can spend on buying a material good instead of life necessity. Children will tend to congregate outside of the Mountain View and Tukul Village hotels as they know that these are the nicer ones with provide more targets of tourists with money. If a child tries one of these schemes on you, do not hesitate to politely tell them that you cannot give them any money. Ethiopia is a socialized state where almost all of the basic necessities of life are provided. For sure the children who approach you are poor, but do have free education, housing, clothing, and meals; typically they are looking just to make some extra money to buy a football jersey or some other material good to show off to their friends. The adults on the other hand are very kind and friendly, and frown on this shameless behavior from their own kids but cannot stop it. After being denied money, children will typically ask for a donation of clothing with a very sad puppy-dog face (unless you are wearing a football jersey, they will ask straight up if they can have this - not out of need, but materialistic desire). There are conflicting opinions on whether to give even clothing: one faction believes that bringing your old clothing donations from home are a win-win, since going to a good cause. The other faction believes that this only encourages children to keep begging instead of leading an honest life, and they would only take your shirt and sell it in the Saturday market for money to buy a material good (football jerseys are especially the hot item among kids). One thing you can be sure to donate without any negative repercussion is food. The Ethiopian Airlines office is opposite of the Seven Olives' entry on the main road, centre town. A minibus to the airport should cost 100 Birr (december 2013) and can be arranged by your hotel. This page was last edited on 4 November 2018, at 06:33.